Bell-crank Style Clamp Design provides positive, rigid locking to all types of rail for quick and accurate set up. In addition, the clamp features both adjustable and preset stops for ease of cutting in both up- and down-leverage positions. Ergonomically-designed Long Saw Arm is standard with the HRS100 and allows the operator full use of the tool in a standing position, reducing fatigue and the risk of back injury. 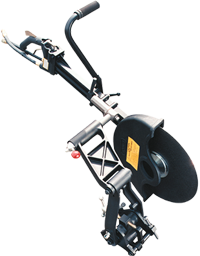 A Full Upright Assist Handle (over guard) is adjustable to accommodate operator preference and collapses for transport and storage of the saw. 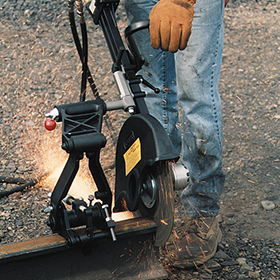 Indexable Swivel on the clamp arm and saw allows cutting on both sides of the rail, eliminating the need to disconnect from and reconnect to the saw clamp.